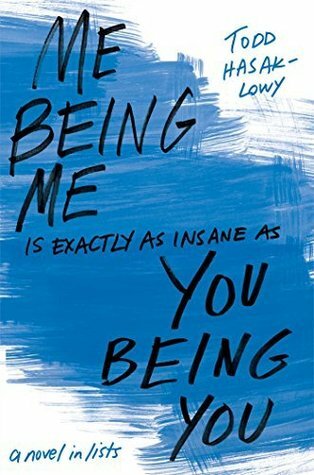 Today, I’m going to be writing a book review for the book Me Being Me is Exactly as Insane as You Being You by Todd Hasak-Lowy! I recieved this book for review from Simon and Schuster Canada for an honest review. I personally loved making lists and this book was full of them! I was really touched by his story. Family issues have never been impacted by major family issues, but it was very interesting to see a different point of view. Personally, this book was a very big eye opener to me. Although, this book was a little bit slow for me, but overall it was well paced. Since this book is full of lists, it was a very quick read for me, although it looks HUGE. The cover is really cute and I really like it. The writing style is (ofcourse) very unique with all of the lists. Some of the lists did not relate to the story, but it made the book even more interesting to read as you can learn more about him. The characters are really interesting and great! I especially liked to learn more about the mother and her back-story. I really loved this book and gave it 5/5 stars! I hope you guys enjoyed this book review! Previous Post Happy Easter & DIY Easter Bookmarks! Next Post Book Release Day: Miss Mayhem! Sounds like a fun book … I relate to the lists … cannot go anywhere without them.